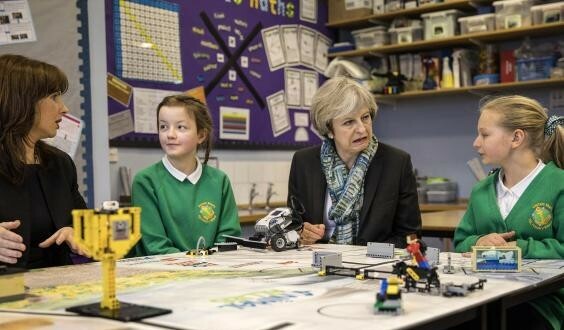 The National Governers’ Association has said the amount of money being provided by Theresa May’s Government is already not enough to educate British children – and the reason is clear: Theresa May cannot stand children at all – let alone the children of poor people [Image: Getty]. Of course, no Conservative wants the proles to be educated properly. Notice that this is the first funding cut since John Major’s Conservative government of the mid-1990s. Headteacher Mary Sandell’s comments are telling – especially where she says “we cannot improve the buildings”. And yet the Conservatives have more than £9 billion to spend building new ‘Free’ schools in places that don’t need them, because it is their vanity project. If there really was no money available, then this would be a different matter; it would be about the economy not providing enough money to fund public services. But that isn’t the case. It is the same story it always is under the Conservatives – they are deliberately taking public money away from us and using it to enrich themselves and their friends. There should be a law against it but, if there was, the corrupt Conservatives would repeal it. The Government is to cut school funding per pupil for the first time since the mid 1990s, a new analysis by the Institute for Fiscal Studies has determined. The respected think-tank calculated that real-terms terms spending on school pupils would drop by 6.5 per cent over the course of this parliament, with further education funding also set for significant decreases. On Monday morning the National Governors’ Association said the amount of money being provided by the Government was simply not enough to educate Britain’s children. “The Department for Education unfortunately doesn’t know how much it costs to educate a pupil whether it be a primary or secondary pupil,” Emma Knights, the association’s chief executive, old BBC Radio 4’s Today programme. The funding shortfall is driving some senior teachers to leave the profession because they say they simply cannot do their jobs properly. Headteacher Mary Sandell of Forest School in Winnersh, Berkshire, said she was one of those quitting for this reason. She said that under current funding levels her school “cannot replace equipment, we cannot improve the buildings, we can’t even afford textbooks for new specifications”. The last thing Tories want is a well educated and well informed general public. Education empowers people and that’s the last thing the Tories want. An 18th century definition of a Tory, which is still very true today, described Tories as people who create and promote divisions within society in order to retain power and wealth in the hands of the aristocratic and propertied classes. That is what the Tories are all about. The fact that the education department can’t work out how much it costs to educate per pupil is a sad reflection o our education system, it isn’t that difficult to work out if you have the numbers available which they should have. The proles lost their best route to better education and upward mobility under the labour governments of the 70’s when the Grammar schools were being decimated and everyone shovelled into lower standard comprehensives on the rather strange idea that the more intellectual pupils would pul the others up to their standard, however as was expected by non experts the opposite happened and the poor students drag the better ones down. Grammar schools were never a good route to better education as ultimately people were admitted according to the amount of money their parents had. Austerity was a lie, there’s always been plenty of money it’s just the tories don’t want to spend it for the good of the people and country.